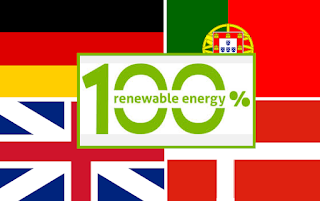 Renewable energy is growing around the world and nations in Europe suggest that the goal of 100 percent renewable energy is possible. In May of this year Germany, Portugal, and the UK all achieved clean energy milestones. Germany produced so much renewable energy that the cost of energy actually went negative for a few hours for commercial consumers. As reported by Time, for a few hours on May 15th, Germany's wind, solar, hydro and biomass plants produced more energy than the nation needed. According to data from Agora Energiewende, 45.8 gigawatts were generated exceeding 45.5 gigawatts of demand. Epex Spot indicates that energy prices for commercial consumption dropped to minus 50 euros ($57) a megawatt-hour. Last year Germany continued its green energy dominance with renewables providing one third of the nation's electricity needs. Chancellor Angela Merkel has been a champion of renewable energy and as part of the nation's Energiewende program the country is committed to eradicating fossil fuel powered energy and generating all of its electricity from renewable sources by 2050. Portugal has been recognized for its climate action for years and in 2015 the CDP singled out Portugal's climate performance as one of the best in the world. For a four consecutive days (May 7 - 11), Portugal was able to get all of its power from renewable energy alone. As reported by the Guardian, during this 107 hour period the nation's solar, wind and hydro generation met all of the countries electricity needs. According to the Portuguese renewable energy association, in 2015 Portugal generated almost half (48%) of its energy from renewable sources. Also in May the UK was able to generate all of its electricity needs without using any coal power for an entire week. Solar power also set new British record by beating coal for a day. Led by Scotland, which derives all of its energy from renewables, the UK is a renewable energy powerhouse. On one day last year Denmark was able to generate 140 percent of its energy from wind power while selling the rest. In 2015, wind power alone met 42 percent of electricity demand in Denmark, 20 percent in Spain, 13 percent in Germany and 11 percent in the UK. Last year a number of renewable energy milestones were achieved in Europe and the US. As revealed by the recent REN21 report, we are seeing tremendous growth in clean power. As investments in renewables have eclipsed fossil fuels it would appear that clean energy has decoupled from traditional energy prices. Renewables are expected to keep growing whether oil prices are high or low. By the end of 2015, if not before, it was apparent that renewable energy is unstoppable. The prodigious growth of renewables also presents some challenges not the least of which is developing strategies to manage oversupply. "This is a significant achievement for a European country, but what seems extraordinary today will be commonplace in Europe in just a few years. The energy transition process is gathering momentum and records such as this will continue to be set and broken across Europe...The age of inflexible and polluting technologies is drawing to an end and power will increasingly be provided from clean, renewable sources." This oversupply suggests that some changes will be needed. As explained by Monne Depraetere, an analyst for Bloomberg New Energy Finance, we need to build technologies that can manage this oversupply including more interconnectors and better energy storage.